Cleanup your bag from items you already learned to transmog! Check out my todo list on GitHub! Is it possible to add an option to sell item such as Ring, Collar and Trinket. Those items can not be transmog so it seems fair that the addon should sell them. Try unchecking "Transmoggable Items Only" in your Can I Mog It? settings. I absolutely love this mod to tiny pieces. As a transmog hunter, it's one of my best Quality of Life addons. I do have one problem, which has always been the case: it doesn't seem to recognise rings and trinkets *at all*. Reading the comments, it seems that "Can't Be Learned" should trigger it to sell those, but it doesn't list them. I tried uninstalling and reinstalling. Having the same issues as other posters- item list is incomplete. The addon doesn't add items to its list that I can't learn, regardless of filter settings, even BOP items that I can't sent to alts. On my hunter, the addon lists ONLY mail items and equippable weapons. It never lists cloth, leather, plate, wands, shields, maces, or jewelry, no matter what's checked off. I'm running v7.0.3-13 with CIMI 7.2.03. Tried reinstalling both/clearing saved vars, same issue. I've just released v7.2.0-1 which should fix some issues, please report back if something still doesn't work! It's working! Lists everything I want. The display is dependant on CIMI settings, though, not sure if there's a way around that. 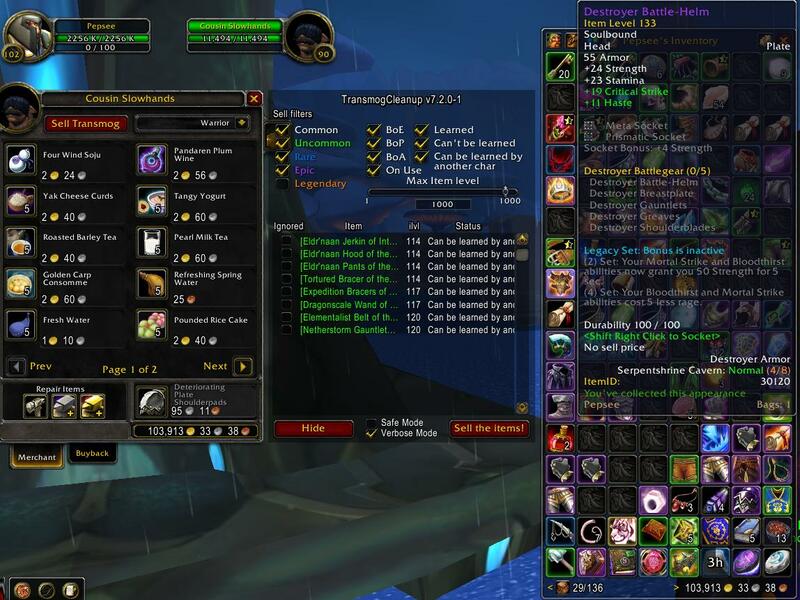 To get trinkets and jewelry to appear, you have to have "Transmoggable Items Only" unchecked, and Transmog Cleanup will list everything in your bags unless "Equippable Items Only" is checked. This is unfortunate, because these settings are also the filter for CIMI's very nice bag icons. Maybe other fishing poles, too. Maybe the addon should just ignore fishing poles. I don't get it, am I using this addon wrong, or expecting what it does to do wrong? Im running old instances and expected it to sell stuff i flat out cannot learn, such as BoP cloth when I am on a warrior, but it doesnt show up. It only suggests things to sell if I can learn it on another character. How do I get this to auto sell stuff that I can never learn on that character and cant send it to other characters? Sorry, its still not working. I just ran serpentshrine cavern and picked up a ton of BoP items that i learned or can never learn (wrong armor type) or already have learned. It only lists a few green BOE items that i -could- learn on another class (if i had those armor type classes). So i'm in the same boat as I was in before. What am I doing wrong? Would it be very difficult to add confirmation tooltips to gear sold at vendors so you know you've got it? You see the items which are going to be sold in the main window. If you enable safe mode only 12 items are going to be sold so you can buy them back easily. Do you need anything else? I've noticed recently that, when going to the vendor and running this, it seems to ignore a lot of the purple items in my inventory. 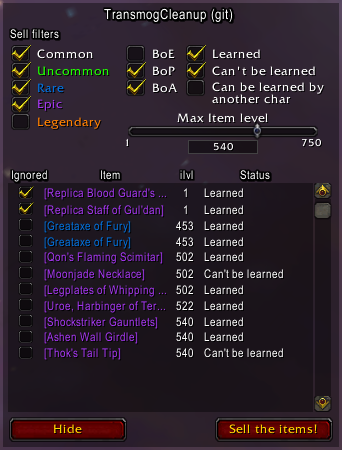 I've got Common, Uncommon, Rare, Epic checked, with BoP and On Use items that are Learnt/Can't be learnt/Can be learnt by another character, with a maximum ilvl of 900, but it doesns't pick up a bunch of stuff from ToC (which says "You have collected this appearance" on it). Is there any debug information I can give you that might help working out what the cause of the issue is? Or is this further up-stream/related to CanIMogIt? I have the same issue (kinda). This addon ignores most, if not all, epic items that my class cannot learn. My bags are filled with tons of leather, plate, and cloth stuff after running through Cata/MoP raids that aren't recognized in TransmogCleanup! awesome addon i love it ! Hey yeah, i plan to improve the filters but i probably won't have time to do it after progress. Now that Legion released the ilvl cap should be raised.